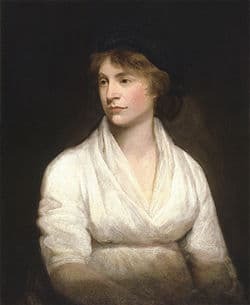 Mary Wollstonecraft (1759-1797) British philosopher and feminist. 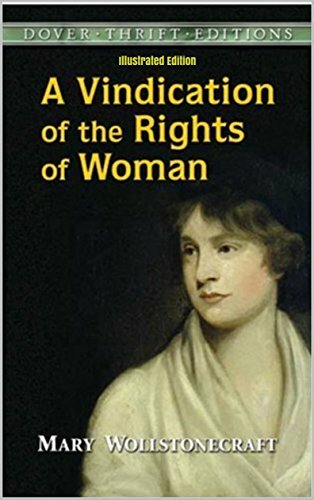 Wollstonecraft was best known for her book – A Vindication of the Rights of Women (1792) which was one of the earliest expositions of the equality of women and men. Mary Wollstonecraft was born on 27 April 1759 in Spitalfields, London. She grew up in a difficult family situation. Her father was often violent and prone to drunken moods, especially after losing money in ill-judged investments. Mary spent considerable time looking after her sisters and mothers. However, in 1778, she tired of domestic life and decided to take a job as a lady’s companion to Sarah Dawson. This proved a difficult experience as she didn’t get on with the old lady. However, around this time, she became acquainted with Fanny Blood, who played an important role in widening Mary’s horizons and ideas. The two became very close and Fanny Blood’s untimely death in 1785 was quite a shock to Mary. For a while, Mary worked as a governess in a large Irish family. She had a talent for teaching but took a dislike to Lady Kingsborough. To Mary, Kingsborough was the antithesis of an ideal woman. In Lady Kingsborough, she saw a woman with no real independence, but primarily concerned with superficial appearances and pleasing men. Mary later developed her thoughts on the concept of a good wife. This experience fermented a desire to become a writer; Mary returned to London where she became acquainted with luminaries such as Thomas Paine, William Godwin and Joseph Johnson. In London, she became more aware of new strains of political and philosophical ideas; the late eighteenth century was an era of change. The old ‘divine rights’ of kings was being replaced with greater faith in human reason and liberty; this sea change in attitudes best exemplified by the French Revolution. Like many radicals, Mary was initially enthused by the French revolution. In 1790, she wrote an influential pamphlet Vindication of the Rights of Men (1790). This sought to defend the principles of the French Revolution against Edmund Burke’s conservative critique. This helped establish Mary as a leading liberal writer; at the time, it was rare for a woman to have such prominence in literary circles. Shortly after the Vindication of the Rights of Men (1790), Mary wrote A Vindication of the Rights of Women (1792). This was ground-breaking work, as it proposed women were the equal of men. Wollstonecraft contended it was only the lack of education for women that meant they seemed to be intellectually inferior. After its publication, Mary visited revolutionary Paris. However, the situation quickly deteriorated, Louis XVI was guillotined and the revolution became increasingly repressive. In Paris, she fell madly in love with an American, Gilbert Imlay. Together they had an illegitimate daughter. When Britain and France declared war on each other, Mary needed the protection of appearing to be married to an American to prevent her being arrested. After her death, William Godwin published her memoirs which proved quite shocking to society. People were not comfortable with the unorthodox and free-living attitude of Mary Wollstonecraft. Even in the late Victorian suffragette movement, Mary Wollstonecraft was given a low profile, as her life sat uncomfortably with Victorian attitudes. However, by the Twentieth Century, Wollstonecraft’s writings were seen as key developments in the concept of women’s rights. In many ways, Mary Wollstonecraft was many years, if not centuries ahead of her time. Citation: Pettinger, Tejvan. 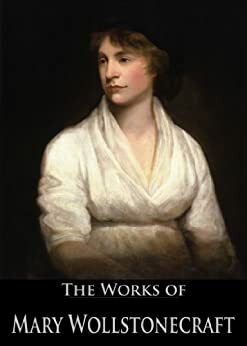 “Biography of Mary Wollstonecraft“, Oxford, www.biographyonline.net Published 26 Jan. 2011. Last updated 15 February 2018.